With the New Horizons spacecraft on its way to Pluto, and scheduled to flyby the dwarf planet in 2015, there is a growing interest in this distant world. Much of this focuses on aspects of the planet that might be important for the flyby. A while back I talked about how computer simulations of Pluto and its largest moon Charon showed that they likely formed through a large collision, and as a result New Horizons should find additional plutonian moons. Pluto and its largest moon Charon are sometimes referred to as a double planet. Charon’s mass is almost a tenth that of Pluto, and their barycenter (center of mass) is actually outside the volume of Pluto. In contrast, our quite large Moon has only 1% the mass of Earth. Pluto and Charon are also so close to each other that they are tidally locked with each other. Now a new paper in Icarus has looked at the atmosphere of Pluto, and found that it may share its atmosphere with Charon. 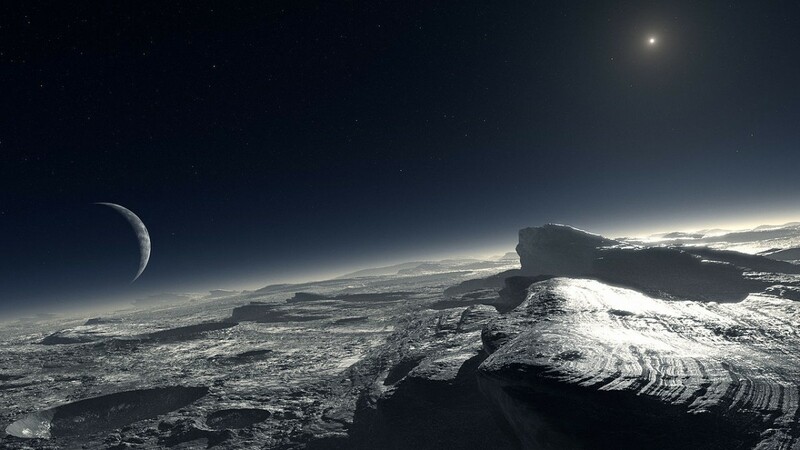 We actually know quite a bit about Pluto’s atmosphere. It was first discovered in 1988 when Pluto transited a dim star. Since then, spectroscopic analysis has shown it contains methane and ethane. We’ve also found that it is thicker than anticipated, although “thicker” in this case means a pressure of about 0.3 pascal, as compared to Earth’s 100,000 pascal. By Earth standards it is basically a vacuum. It is also apparently thick enough and warm enough that some of it is exchanged to Charon. Using the known characteristics of Pluto’s atmosphere, the team showed that this exchange is large enough to consider that Pluto and Charon have a common atmosphere. The timing of this discovery is perfect, because detectors onboard New Horizons will be able to detect the atmospheres of Pluto and Charon and determine if they have the same chemical signature. If so, it is one more reason to consider them to be a double system. And who knows, it might also be enough reason for astronomers to re-label Pluto as a planet, which is what everyone really wants in the end. Paper: O.J. Tucker, et al. Gas transfer in the Pluto–Charon system: A Charon atmosphere. Icarus. DOI: 10.1016/j.icarus.2014.05.002 (2014).